Often referred to as the Fifth Major on the PGA Tour, The Players Championship played at the TPC Sawgrass is one of the premier events on Tour. A field of Top World Ranked golfers take on arguably the toughest 2 finishing holes in golf - the iconic TPC Sawgrass Island Green on 17 and a tough Par 4 18th hole. As mentioned it is known as the 5th major which is ironic now that it has been bumped on the PGA Tour schedule by the 4th major. The PGA Tour has moved the PLAYERS Championship to March and moved the PGA Championship into May to be the second major of the year played after the Masters in April. Regardless, the PLAYERS Championship will still have a solid field with one of the biggest paydays of the year and 600 Fed/Ex Cup points up for grabs...it may start to be known as the unofficial 1st major of the year! Although The Players is played on the same course every year, it is a tournament not known for repeat champions. For amateurs DFS players trying to make 2019 Players Championship fantasy golf picks, picking winners on the TPC Sawgrass stadium course can be unpredictable. If you are entering DraftKings Huge 5th Major Fantasy Golf Contest you are going to need more than just "FREE" Expert Golf Picks that some sites are offering. It is also the first really big fantasy golf contest of the year with a total prize pot of $1 Million...for just a small $10 entry. Not a bad payout for this contest! 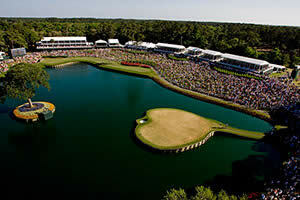 Unlike the 4 majors, there is no real recipe of success at TPC Sawgrass. Short hitters, long hitters, old guys, young guys… Making fantasy golf picks for The Players maybe should be left to the experts – especially when the 17th hole can take out a leader in an instant! For REAL Expert Golf Picks you should check out the expert golf handicappers we listen to the most at GolfStats.com - a proven winner. Originally called the "Tournament Players Championship"
Being one of the biggest tourneys on the PGA Schedule, there will be a number of choices for picks for the Players Championship. Well known golf sites such as The Golf Channel, Yahoo Fantasy Golf, ESPN fantasy golf, as well as the PGA Tour website itself all offer free “expert picks” and then don’t forget the countless blogs out there with their ‘Expert Picks for the Players Championship’. You need to decide which picks are reliable and worth using if you are putting money down either playing fantasy golf, or betting at a site. One of the top sites that offer Players Championship Expert Golf Picks is Golfstats. They have had a winning record for the last 3 years and if you are dedicated to playing either fantasy golf for cash, or betting on golf you need to try out GolfStats.com. Their system is set up as a long term play and although you may not win the first few times out, by the end of the year by following their system, you will win cash! For Golf Betting – Take the list of winners and play the same amount per golfer. You just need one to hit to win money! For Fantasy Golf – Take the list of golfers and create a salary cap at your favorite fantasy golf site with as many of the picks as possible. If you are playing multiple lineups, try out different combos for better results. Make sure you take advantage of our special contest Fantasy Golf Contest below - It's FREE to enter with your 1st deposit! Lots of sites offer you their expert FREE picks…but someone who has a blog on the side of his day job and watches golf on the weekends IS NOT AN EXPERT! The Players Championship is historically one of the hardest tournaments to handicap, even if you look at various golf betting sites to see TPC odds, you will see a varying spread for different golfers.